Preamble: this post is about the tax benefits of having a secondary source of income in South Africa. Some of the tax legislation mentioned here is specific to SA tax law. However, the principle should still apply (to varying degrees) in other tax jurisdictions as well. Every country wants to emphasise entrepreneurship. Some do it more than others. The other day, I had a little reminisce about second jobs and sideline businesses. I’m not sure how common it is: but I’ve always had more than one iron in the fire. For most of my working life, I’ve had a tutoring gig on the side. Even when I worked formally as a tutor for my university, I continued to tutor high school students in the evenings. Then there was that time when my buddies and I hired a driver and had him drive an Audi for UberBlack (unsuccessfully – UberX came along and put paid to that almost before we’d started). But I’m not alone in this (at least, not in my friendship group). Some of my old work colleagues have bought apartments to post on Airbnb (in Cape Town, for the most part). I have friends who rent out their first homes now that they’ve outgrown them (and turned them into second homes). Some of my professional friends do freelance work on the side. Or they’ve started a small business. Or they’re working on an app (those are the sexier friends). It’s not necessarily widespread. But it’s not uncommon either. And while the extra income is great – I wanted to emphasize that this is the kind of thing that can benefit you even if you don’t make a lot of money. As a standard employee, you’re not allowed to claim very much in the way of expenses. Your PAYE (payroll tax) gets deducted each month. And maybe at the end, you’ll get a small refund because of some allowable deduction (like medical aid contributions). Naturally, you’d need to split those costs out in the ratio of business use to private use. But still, there’s a deduction. And it could earn you a larger refund. All of these expenses, you would have incurred anyway. In all likelihood, you were always going to pay for internet and own a lap top. Therefore, there is no economic cost to you when you taking up freelance web design. The costs are already sunk. Instead, what you’re doing is recovering some of those costs by using them to generate income. On the tax side of things, SARS doesn’t care whether you would or would not have otherwise incurred the expense – what’s important is that the expense actually incurred was used in the production of income. 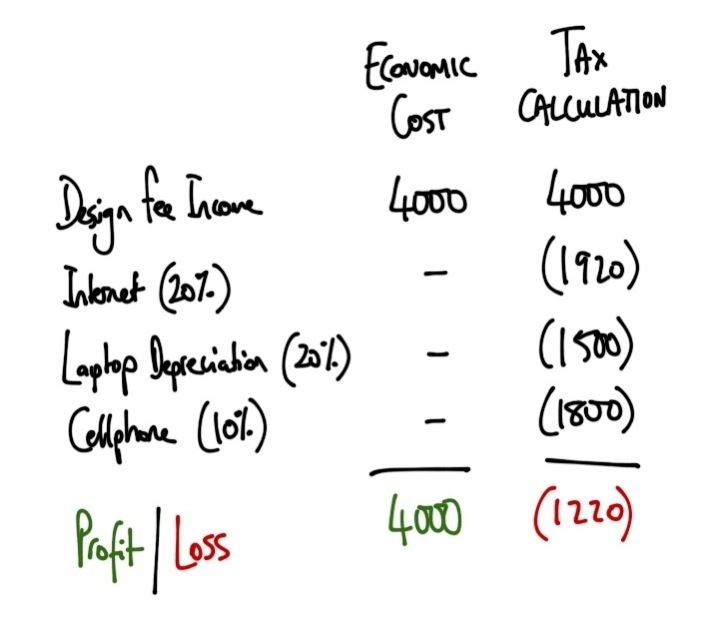 So if you take some of your internet cost, and use it to design websites for money, then that’s an expense actually incurred in the production of that income – therefore you can deduct it from your gross income. These deductions are effectively an incentive that SARS offers you to be entrepreneurial. The net result here is that your tax losses from your ‘secondary trade’ would go against your employment income and get you a larger refund. That is, until such time as your secondary trade becomes profitable. But if you hit that point, then you won’t care about the tax – you’d have a profitable side-trade! Now obviously, SARS doesn’t intend for you to be indefinitely loss-making. If you’re going to be entrepreneurial, then it’s expected to pay off eventually. So there’s a section in the Income Tax Act (section 20A, for anyone that’s interested) that says if you’re loss-making from a particular “secondary trade” for longer than 3 years (or something like that), then you can’t deduct the loss from your full gross income anymore. However, that ring-fencing only applies to people that would otherwise be in the top income bracket. So if you’re in a lower income bracket (which is almost all of us), then the ring-fencing will not apply. As it stands – the regulations could always change. Entrepreneurship is a good idea. Even if you’re not going to make all that much extra money to start – at the very least, you’ll get a nice tax refund.